Gary Wilson, Sr. Vice President, Marriott Corp. in 1983. 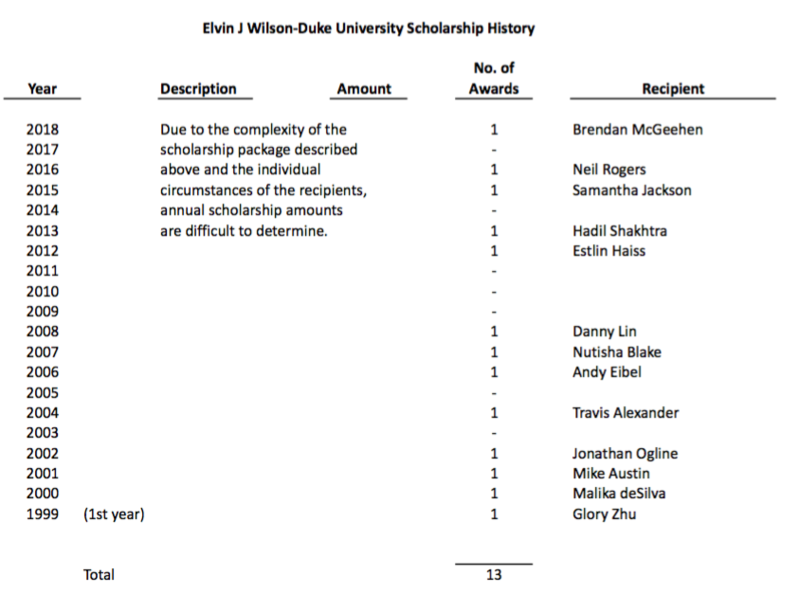 The Elvin J. Wilson – Duke University Scholarship was established in 1998 by Gary L. Wilson in memory of his father, who was a local, well-known business man and civic leader. He served as a councilman-at-large for multiple terms on Alliance City Council. Elvin and his wife Fern valued education greatly and encouraged their two sons to attend the best universities they could. Gary graduated from Alliance High School near the top of his class in 1958. He earned a football scholarship to Duke University for his successful playing years at AHS under legendary coach Mel Knowlton, who he credits with preparing him for athletics at a higher level. Following his graduation from Duke in 1962, he went on to receive a scholarship from the Wharton Graduate School of Finance and Commerce at the University of Pennsylvania, where he earned a Master’s Degree in Business Administration. After honing his skills in the Philippines’ sugar industry, Gary joined the Marriott Corporation in 1974 as executive vice president for finance and development. In 1985 he moved on to Disney Corporation where he served as executive vice president and chief financial officer until 1990 when he joined Northwest Airlines as co-chairman. Gary became chairman of Northwest in 1997, a position he held until 2007. He has been credited with growing companies through expansion and innovative financing everywhere he has served. Gary is currently a director for CB Richard Ellis, a commercial real estate company. He is also a trustee emeritus of Duke University and serves on the board of overseers of the Wharton School at the University of Pennsylvania. He is also a member of the NCAA Leadership Advisory Board. Remembering his home town roots, Gary credits his parents, the late Elvin Wilson ’35, and Fern Donaldson Wilson White ’38, for providing a stable environment, integrity and a moral background that allowed him to grow. He also credits his football coach, the late Mel Knowlton, who taught him discipline and the late John Bentia, former Alliance Manufacturing President where Gary worked summers, who he emulated, in part, by reading the same books. This annual scholarship is affiliated with the Alliance High School Foundation, but is privately funded and awarded annually to a student who has met the stringent entrance requirements and is enrolling at Duke University. Duke University will pay half of the scholarship with Gary Wilson contributing the other half. The remaining portion of the cost to attend Duke is a package that includes a work program, grants and loans.